Water Frontage – Fantastic Views! 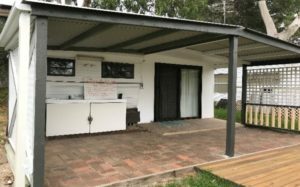 Caravan & aluminium annexe with Covered Deck. Caravan & aluminium annexe with awning. W.I.W.O – Includes: Current furnishings. Sewer Available, close to amenities. 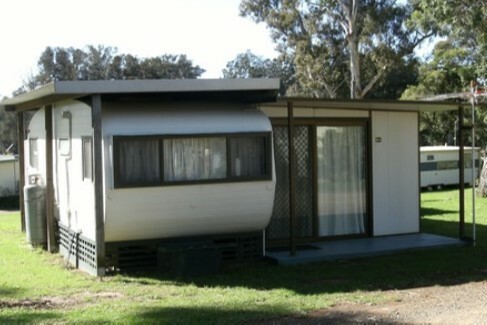 Caravan & aluminium annexe with ensuite. Includes: Two fridges, gas stovetop, microwave, assorted furnishings. 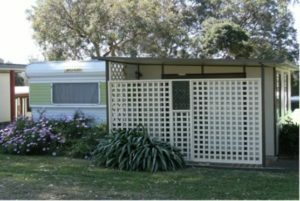 21′ Millard caravan & aluminium annexe with small deck. W.I.W.O. – Includes: Lounge chairs, TV, wardrobe & other furnishings. No ensuite, but close to amenities. 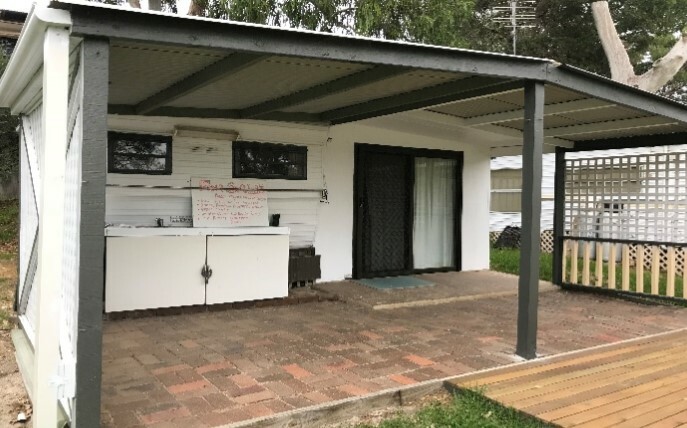 20′ older caravan and aluminium annexe with full width timber deck. Includes: Microwave, BBQ, medium refrigerator, kitchenware, linen, TV, lounge, queen size futon, table & chairs and double bed. 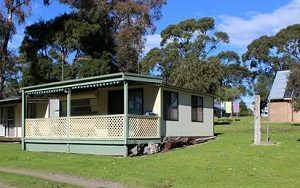 Located in a quiet area of the park with lake views and ample parking. The van comfortably sleeps 4 persons and the amenities block is only 100m away. Great views of Wallage Lake! 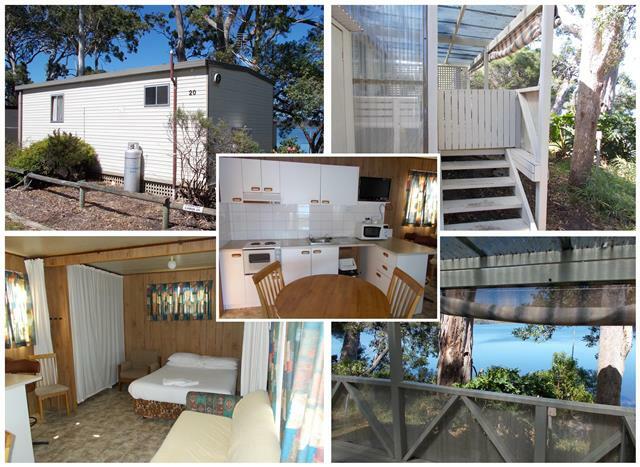 Open Plan 1 Bedroom Cabin with kitchenette, ensuite and enclosed deck. 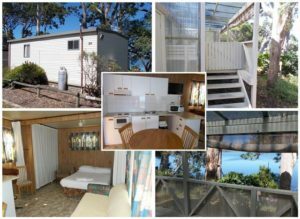 Includes: separate bedroom with small single bed, kitchenette, current furnishings. If you are to make an offer on any of the vans for sale it is recommended that the offer is made subject to an on-site Orientation with park management to ensure that fees are not outstanding or alterations are required to the site. Before any money is exchanged when purchasing an Annual Van/Cabin please be aware that some vans may need work carried out in order for them to comply with Park and or Council regulations. 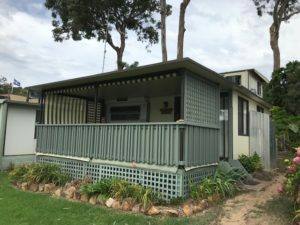 Once a sale occurs the new owner will be responsible for any fees outstanding including the final electricity account plus any work needed on the site. Please Note: It is a requirement that a Site Orientation be carried out with park management on-site prior to purchasing a cabin or van. Any van sale that occurs, that is not listed through Regatta Point Holiday Park’s office or does not take the required steps listed above prior to the sale, will be given 21 days to be removed from their site. NOT all Annual Van Sites in Regatta Point Holiday Park are ensuited! For any further information see below or please email info@regattapointpark.com.au. The following is an extract from the full version of the Regatta Point Holiday Park Rules included in the Long Term Casual Occupation Agreement. It is meant as a guide only in answering the most frequently asked questions. For more information, please contact our office between 8.30am – 5.30pm Monday-Friday on (02) 6493 4253. Site fees are due: 1st July, 1st Oct, 1st Jan & 1st Apr in advance. Site fees are subject to change at the beginning of each financial year. All accounts are payable ONLY via the Westpac PAYWAY debiting system from either a nominated bank account or credit card. Accounts are sent out each quarter. The maximum number of persons to occupy the van at any one time is 6 persons (including infants). Occupation of your van is limited to six continuous weeks, and to a maximum of 150 days each financial year included in your fees. You may occupy your van for a maximum period of 180 days in any financial year. These extra days attract extra fees at the visitor rate. You cannot occupy your van on a permanent basis at any time. Your site fees cover 6 nominated people. All others will be charged at the visitor rate of $15 per adult and $10 per child, infants 0-2 years free. This includes day visitors – that is, any persons who stay on the site longer than 4 hours in any one 24 hour period. Please have your visitors register at reception during office hours. This register assists in maintaining accurate records and maintains security, likewise when trades people are attending your van. A parking space is provided for 1 vehicle ONLY. A second vehicle may be permitted only if it’s parked wholly on the site. A trailer or boat are counted as a vehicle. It is recommended that a site orientation with Park Management be carried out before any money is exchanged on van purchases within the park. The orientation will cover all aspects of owning a van such as car parking, boat storage, alterations to the site, visitors, etc. Due to high weekend trade and staff workload, the site orientations can only be conducted Monday – Friday during normal office hours. (Please contact the park to arrange this time in advance). For any exchanges without completing the orientation, the new van owner will need to meet with management on-site for a site orientation within 14 days of the purchase date. Pets are NOT permitted in this park, including visitor’s pets.